The right lighting at any event can be the difference between a good corporate event or an amazing one. 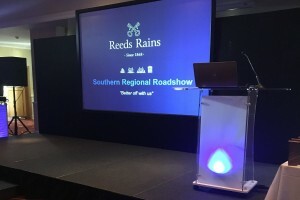 The right sound, staging, lighting and audio visual equipment, is crucial to the success of the event, but the lighting really makes it stand out and can bring a corporate event to life. 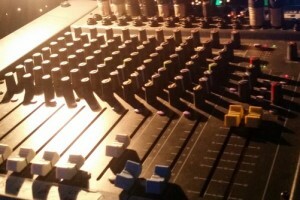 It creates the right atmosphere for any event. Tornado Event Hire offers delivery, set up and collection on all its packages for different sized events, giving you peace of mind that all the logistics are covered. We have all kinds of lighting equipment for hire for your corporate event from star cloths, to flame machines and lasers. As you can imagine, larger events generally require more impressive and substantial lighting. There is a lot of scope with a large event to go to town with lighting equipment to really showcase the event. Your Move Estate Agents in Buxton, turned an afternoon presentation into its Christmas Party in the evening with a little help from our equipment! We not only provided a big screen to play music videos on, but at the same time the overhead scan lights and floor mounted moving heads changed colour to the beat of the music. Do I need to ask the venue to provide anything? When we have agreed on the best lighting for your event, we will provide all that is needed to facilitate the lighting. Do you have rotating lights? Yes we have overhead coloured scan lights that can rotate. 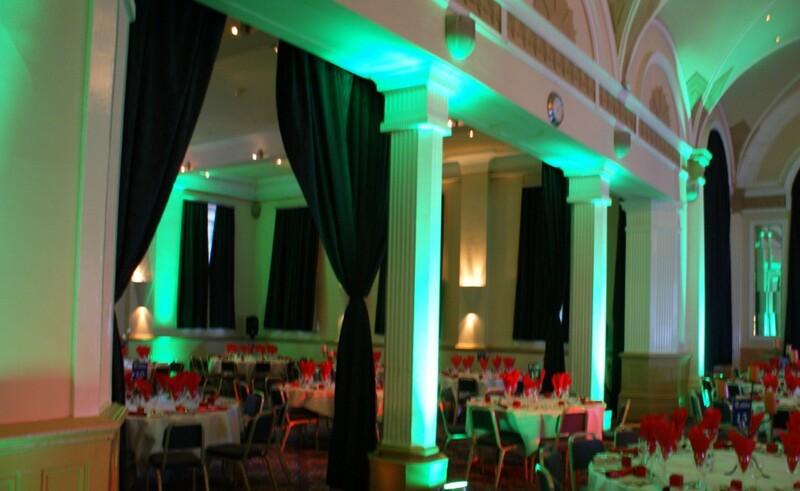 Smaller sized events such as conferences can also have extensive lighting to really set off the occasion. We can use star cloths, uplighters and flames to focus the delegates on the main stage and head lights and spots to highlight specific areas. The use of different coloured lights (potentially to match your company colours) can provide synergy with your corporate message. Your Move held a Conference and Awards Ceremony in January 2015 in Penrith. Cumbria. A combination of lights were used to give the desired effect for the client including hanging a star cloth as background. 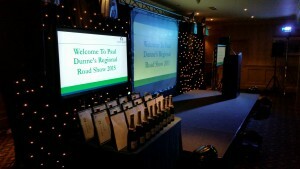 We used bright white bulbs in the over head scan lights and moving heads on the floor which was really effective in showcasing the Award Winners. 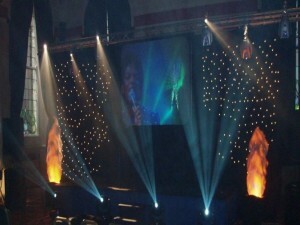 The Awards’ Presenters were lit up using LED stage lights and a dimmer DMX controller. Would I have to set the lighting up for my event? We would do all setting up for you, leaving you to concentrate on your event. Do you provide lighting for outdoor events? Yes we do. We have special exterior lights and cables for exterior lighting. Providing effective lighting for smaller events can be just as complex as it is for large events. With a smaller venue the lighting has to complement the venue and not over power it. Paul Skavydis wanted to organise a party for his wife in Stevenage, Hertfordshire in their home. The package we provided not only included the lighting but also the sound equipment, namely the speakers, amplifier, CD players and the sound desk. 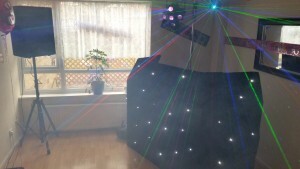 The lighting hired was the DJ Star Cloth booth and some disco lights to create a great atmosphere. As with all our equipment hire, we tailor the lights required to the needs of the host and the venue the event is to take place in. If I just want a few spots for my presentation, would that be something you would do? Yes it would. We have a range of equipment for hire for all event sizes. Do I need lighting for my meeting? It depends on the meeting and what you want to achieve. Feel free to contact us to discuss your needs and we will endeavour to assist you.